I'm generally not a huge fan of bagged popcorn, or popcorn in general for that matter, but I'll make an exception for caramel corn. I'd tried the Mango Coconut Caramel Corn TJ's had over the summer and was wildly unimpressed, but I decided to give it another shot when I saw this Pumpkin Spice Caramel Corn on the shelf. As soon as I started eating it, I was glad I did! 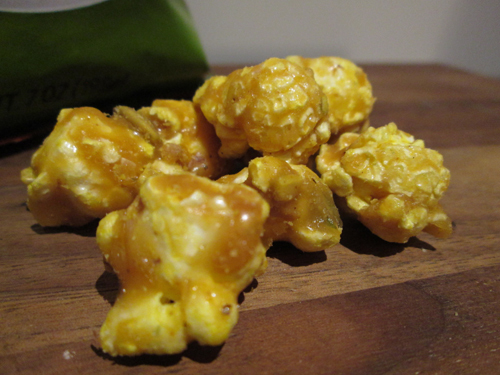 While I don't think I've ever had bad caramel corn (aside from the Mango Coconut abomination from Mango Madness over the summer), this definitely stands out as some of the best. 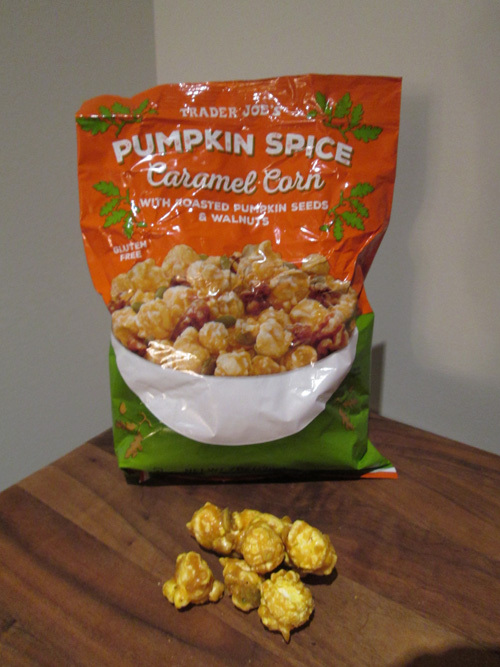 Pumpkin in general pairs pretty fantastically with caramel, so these are really just two flavors that were meant to be united in the form of popcorn. The caramel is definitely the dominant flavor here, but the pumpkin definitely adds to it, while the addition of roasted pumpkin seeds and walnuts gives the popcorn a nice crunchiness. My only caveat about this product is that it's a little pricey at $2.99 for a fairly small bag. Still, it's definitely worth it, and I'm planning to buy another bag when I go back to TJ's this weekend!